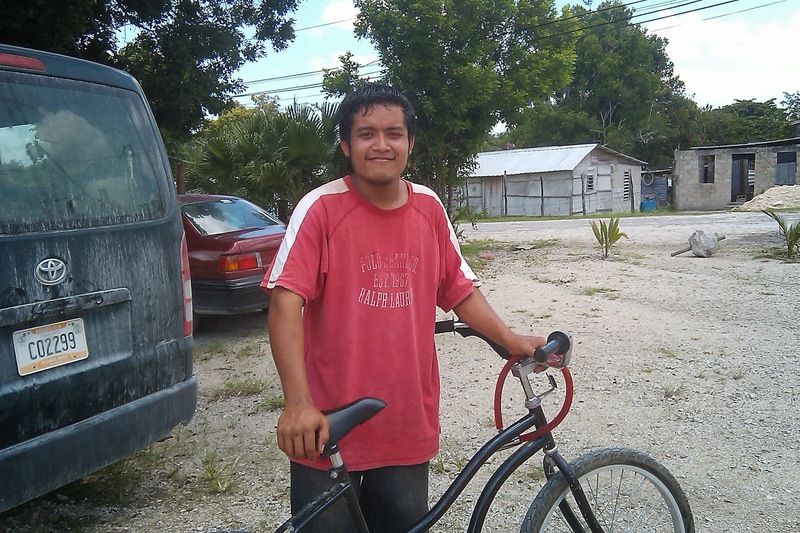 On December 4, 2013 Edgar went home to be with the Lord. He was only 19. We miss him. Edgar had cancer that started in his lymph nodes in his pelvis. He noticed some pain a year ago, but like people here in Belize, he just dealt with the pain. It wasn't too bad. Then he dropped 50 pounds in only two months. That got our attention. We took Edgar for an ultrasound and found he had enlarged lymphnodes. The doctor told us to get a bone marrow aspirate to determine if it was Leukemia. That was impossible to do. The doctor he referred us to said he does not do the procedure. There was no one in Belize who could do it. Edgar would have to go to Mexico to a doctor there. Neither he or his mother had a valid passport. We applied for a passport for him...it never came. (It got lost? I don't know. We waited the three months it takes to get the passport and it never came.) By that time he was worse. He had no energy and was urinating blood. I took him to an internist to find a way to diagnose the problem without the bone marrow aspirate. He ordered lots of tests and suspected Hodgkin's lymphoma. He wanted to do a biopsy of the lump to make sure. November 19 we admitted him for the biopsy. By that time every day seemed to add to his complications...lumps grew in his throat (lymphnodes) which blocked his breathing. He couldn't swallow food and had trouble swallowing water. All of his bones ached. He couldn't sit up or walk to the bathroom. He was spitting up mucus.... then spitting up bile. This cancer was torturing his body. It's a cruel disease. Finally he somehow sat himself up, pulled out his IV, and demanded that he go home. The doctor released him. He died at home 6 days later. This is Edgar 2 years ago. We used to go out to lunch now and then. I liked to treat him and talk to him to try to guide him to make good decisions. This is Edgar praying in our church in September. He was the person who opened our worship with prayer. He always prayed a long prayer. Some of the children Sulmi's age laughed and looked at their watches, but I told them "Watch! He is speaking words from God. We need to hear what God is saying through him." Edgar, who was a young man of few words, prayed powerfully. He always told the people to live in peace with each other, to love and forgive each other. He always told the boys to avoid temptations, he told them to come to church and to obey God. This is Edgar at Boyz Bible Study. He never missed it. Edgar was a good friend. We miss him terribly. On Friday December 6, his birthday, we had a funeral at Jesus' Deaf Church. The church was full. Over half of the people were Edgar's Deaf friends, some who came from as far as 3 hours away to remember him. Now our dear brother lives joyfully in peace with Jesus...sitting at the feet of the Lord and praying for us all to make righteous choices. You spoke into his life and he did yours. May His words bring you comfort and joy for our brother Edgar. Thanks for this window into who Edgar was. I'm sorry for your loss. Good bye my friend Edgar. See you soon.